The Hostel i Edinburgh, Skottland: Bestill nå! The Hostel, 3 Clifton Terrace, Edinburgh, EH12 5DR. Please no credit cards on arrival - All transactions carry 10% fee. We have a Quiet time Policy from 2300 - 0800 so guests can sleep!. Staff wake-ups are charged at 5 each time for non emergencies. **Please note this hostel has a minimum Cancellation Policy of at the latest 10.a.m. 2 days before date of arrival** i.e. Cancellation for Friday arrival must reach us by 10.a.m. Wednesday. For Groups and new years reservations see relevant clause below. No amendments are allowed on or after arrival all balances paid on or before arrival and are NON-REFUNDABLE. Hogmanay (New years reservations that cover the 31st of December) ALL RESERVATIONS MUST BE PAID IN FULL BY THE 1st DECEMBER. CANCELLATIONS MUST BE MADE BEFORE the 1st DECEMBER OR YOU WILL BE CHARGED THE FULL AMOUNT OF THE ENTIRE STAY. ALL DEPOSITS ARE NON-REFUNDABLE IN ANY CASE. Any reservations made after the 1st December must be paid in full and are non-refundable. Terms and Conditions and Cancellation procedures. This list is neither limited nor final on date of release. Any further details or changes will be forwarded to the customer as soon as applicable. 1.a. All deposits and pre-paid stays are non-refundable in any circumstance. This also accounts for people who wish to shorten their reserved stays after payment on arrival. 1.b. All cancellations must be made by telephone or email by a minimum time of 10a.m. 2 days before arrival or the full cost of 1 nights stay shall be deducted from the bookers credit card details. Group and New Years reservations see above. 1.c. Group bookings of more than 8 people cannot be canceled within 7 days of arrival date and the FULL cost of the entire stay will be charged. 1.d. Hogmanay (New years reservations that cover the 31st of December) ALL RESERVATIONS MUST BE PAID IN FULL BY THE 1st DECEMBER. CANCELLATIONS MUST BE MADE BEFORE the 1st DECEMBER OR YOU WILL BE CHARGED THE FULL AMOUNT OF THE ENTIRE STAY. ALL DEPOSITS ARE NON-REFUNDABLE IN ANY CASE. Any reservations made after the 1st December must be paid in full and are non-refundable..
2.a. Any Group reservations of 8 or more people MUST provide a minimum 20 per person cash security deposit on arrival as security on any losses incurred through damage, nuisance to other guests and loss of revenues. i.e. Damage to bedstead = 110, sickness/soiling = 25+ etc. Any arrivals after 11pm incur a 5+ fee and must be arranged in advance. The breakfast provided is free of charge and may be withdrawn at any time. Due respect to other guests should be shown whilst staying in our hostel. We have a traffic light system for all deposits. One warning from staff - Green, 2nd Warning - Amber = Complete loss of all Security deposit, 3rd Warning = Immediate removal from the premises. Bringing guests back to the Hostel is strictly prohibited and may result in immediate removal from the hostel of the entire group with no refund. 2.b. Any costs not covered by the security deposit may be taken from the Original Credit Card used to make the reservation or otherwise invoiced by arrangement. Ultimately the person who made the reservation is responsible for any and all costs required to be paid to West End Hostel or its Named representative. 2.c. A log will be kept of any incidents and where possible cctv footage will be used as evidence in any case. We reserve the right to refuse entry to anyone who we feel is unfit through alcohol or drug use or may present a threat to any guest or staff. West End Hostel, 3 Clifton Terrace, Edinburgh, EH12 5DR. All group Bookings will have to place a 10 - 20 per person security deposit depending on the nature of the group. In the case of schools/children this may be arranged privately. At The Hostel we provide comfortable accommodation at great rates! We understand that whether travelling as a tourist, backpacker or getting away with friends, comfort and budget are high on the list of priorities - we provide that and more, in the most stylish and funky hostel in Edinburgh! Located directly opposite Haymarket Train Station in the West End, The Hostel is only a 15 minute walk to the West End of Princes Street. We are also opposite the city's busiest bus interchange so you will have no problems transporting yourself in and out of the neighbourhood. Edinburgh Castle and the famous Royal Mile are a must see and are easily accessible on foot or by public transport. Right on our doorstep we have the wonderful St Mary's Cathedral, a popular tourist landmark. An easy 15 - 20 minute stroll is the infamous Grassmarket area & there are a range of bars and restaurants within 100 metres of The Hostel. We can highly recommend our sister unit The West End Hotel for food & drink, where guests of The Hostel will receive up to 20% off their bill. Please read all the details below before you book for an understanding of why we think 'The Hostel' is the place for you to stay in Edinburgh for the single traveller or groups of up to 95! *Laundry (wash and dry for £3) – this is subject to availability as hostel laundry is done in house. *Loch Ness and Highlands tour booking facility from reception. PLEASE NOTE that there are limited electrical sockets in the dormitories. These plugs can only be used for charging mobile phones and laptops. Using these plugs for anything else will automatically shut off the power. Items left to charge are done so at the owners own risk and the hostel cannot be held responsible for any items in the rooms or the public areas. There are extra sockets in the public areas. We ask guests to please remove items when they have finished charging to allow other guests access to the sockets. •Children under 18 are not permitted in the dorm rooms. 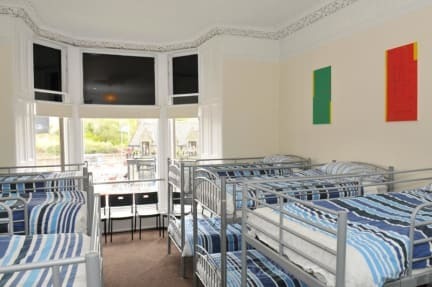 Anyone booking children into one of our dorm rooms will not be allowed to stay and will be required to find themselves alternative accommodation. •ALL guests checking into the hostel must have photographic ID with them in the form of passport, driving license etc. Unfortunately check in will not be permitted unless photo ID is provided. •Check in is from 2pm and check out is 11am. Luggage can be left with us outside these times. •Any guests arriving after 11pm will be required to pay a £5 late arrival fee to the member of night staff. Please note this is a one off fee of £5 and not £5 per person. *Triple rooms consist of lower double bed and upper single bed. *Family room consists of 3 single bunks and 1 lower double bunk. Any guests arriving after 11pm will be required to pay a £5 late arrival fee to the member of night staff. Please note this is a one off fee of £5 and not £5 per person. Please note that if you are a group of 8 or more people you will be asked to pay the remaining balance as a group (not individually) and leave a £20.00 security bond per person on arrival. This bond will be returned on departure once the room/s have been checked by a staff member. Please note that you should allow time for your room to be checked on departure as this can take up to 15 minutes, if you fail to leave time for your room/s to be inspected bonds will not be returned. If we require any damages to be inspected by the owner, bonds will be kept and returned to you at a later date once a price has been determined for the damage. Disturbing other residents will also result in a penalty charge, the amount will be determined on a case by case basis. 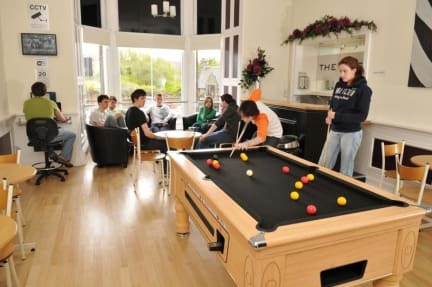 Upon arrival at the hostel your group will be asked to read through an introduction letter which lists damages and penalty charges as a guide only, the hostel reserves the right to change these at any time without warning.